Gold was modestly lower overnight, consolidating after yesterday’s $16 gain in a relatively narrow range of $1336.20 - $1342.65. It ticked up to its high early during Asian hours, as the dollar softened against a rising yen (yen improved from 105.95 - 105.69 on trade concerns), euro ($1.2290 - $1.2335), and pound ($1.4039 - $1.4088). Gold also received some support from early weakness in global equities as the sharp selloff in the US yesterday spilled into the Far East and early European trading. The NIKKEI was off 0.5%, the SCI fell 0.8%, Eurozone shares opened 0.8% - 1.5% down, and S&P futures were near unchanged. Later during European time, gold was pressured to its $1336.20 low as Eurozone shares pared losses, the S&P turned positive, the US 10-year bond yield ticked up to 2.759%, and the DX bounced to 90.12. The greenback was aided by a softening euro ($1.2286) from weaker readings on German Retail Sales and Manufacturing PMI. After a choppy open (Trump once again attacked Amazon via Twitter, wreaking havoc with its stock and the sector), US stocks turned positive by mid-morning (S&P +31 to 2606), as tech shares pared losses from yesterday. 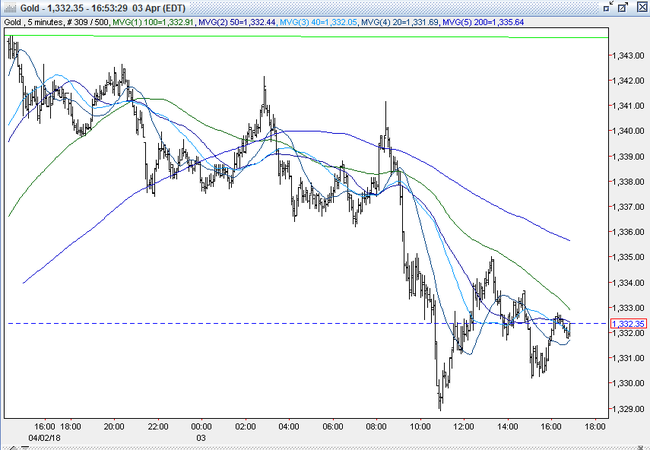 A recovery in oil (WTI to $63.74) aided the move. The 10-year bond yield improved to 2..784%, and the DX rose to 90.28. 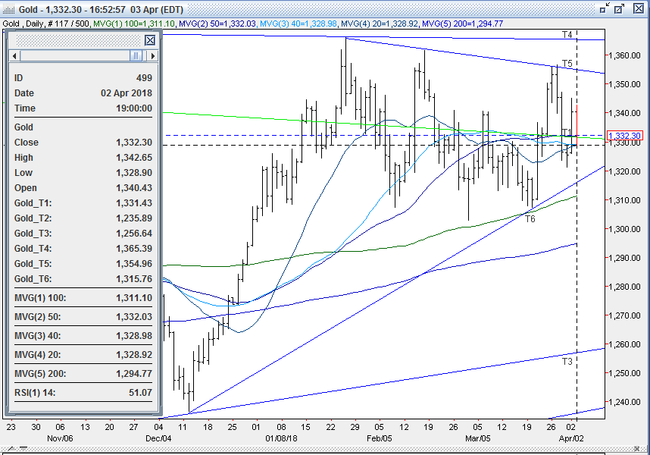 Gold tripped some sell stops under the overnight low at $1336 to reach $1329. In the early afternoon, US stocks turned back down (S&P +5 to 2580), slipping below the key 200-day moving average for the 2nd consecutive session. The 10-year yield sank back to 2.768%, while the DX retreated to 90.12. Gold rebounded in response, and touched $1334.75. Later in the afternoon, however, equities rallied sharply (S&P finished + 37 to 2620, tech and energy sectors lead advancers), aided by a report that the White House was not contemplating any action against Amazon. The 10-year yield reached 2.79%, and the DX remained steady between 90.17-90.22. Gold pulled back to $1330, and was $1332 bid at 4PM with a loss of $9. Open interest was up 1.9k contracts, showing a net of new longs from yesterday’s rally. Volume was similar to last Thursday’s with 265k contracts trading. Bulls were disappointed in today’s $10 drop, but even the ultra bulls realize that sessions like today – when equities climb significantly along with the 10-year bond yield and the dollar - gold will struggle. Bulls look for a consolidation around today’s $1332 finish (50% retracement of up move from the 3/20 $1307 low to the 3/27 $1357 top) in the very near term, but near / intermediate term, they expect the dollar will resume its downward trajectory to propel gold higher. With the favorable fund positioning, bulls expect buys stops to cascade over resistance levels at $1356-57 (3/26, 3/27 highs), $1362 (2/16 high) and $1365 (down trendline from 7/6/16 $1375 high, 5 tops - 1/25, 8/2/16, 8/3/16, 8/4/16, and 8/5/16 highs) to challenge the 7/6/16 high at $1375. Bears continue to be comfortable selling into strength, knowing that gold’s forays north of $1340 have been rally graveyards for months. They expect this one to be no different, and will look for today’s pullback to continue into the mid-low $1320’s. Below this level, bears expect some liquidating sell stops to bring about a test of the key $1307-$1310 support area. All markets will continue to focus on the volatility in the equity and bond markets, geopolitical events, developments with the Trump Administration, oil prices, and will turn to reports tomorrow on China’s Caixin PMI, Eurozone CPI, US ADP Employment Change, Markit Services PMI, ISM Services, Factory Orders, Durable Goods, Oil Inventories, and comments from the Fed’s Mester for near term direction. Looming ahead Friday is the much anticipated US Payroll Report.